Discover the depth and reality of God’s amazing love! God loved the people of the world so much that He gave up His one and only Son (John 3:16 PEB). Christianity should be the most exciting adventure of your life! Your world comes alive with possibilities as you discover the true desire of God. Each page is more exciting than the previous. You will learn the secrets and eternal truths of God’s love through Jesus Christ. Discovering the Basic Truths of Christianity covers the major biblical tenets including faith, baptism, knowing Jesus as Savior, forgiveness, repentance from sin, the resurrection, and many others. Laying a solid foundation with contemporary examples brings focus to the timelessness and practicality of the Word of God. This book is part one in the series Biblical Foundations for Your Life. 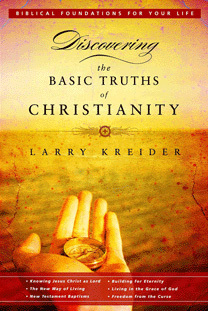 The second book is entitled Building Your Life on the Basic Truths of Christianity. Save even more! Get both books in the series for $16.50! Click here for more info.